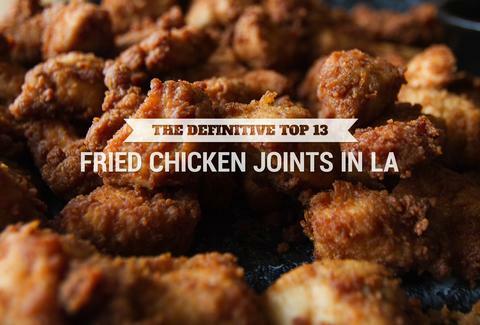 Because fried chicken has totally earned it (one day, burritos, one day), we asked a panel of ultra-esteemed food writers to give us their picks for the best fried chicken in LA (FWIW, ChocoChicken was disqualified for being too new). Then we tallied up all the votes and came up with this list of the definitive top 13. 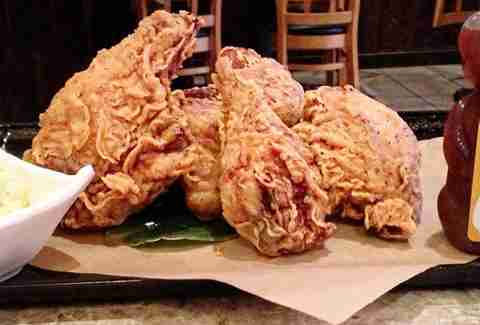 This spicy soul food shack's fried chicken is worth venturing into South Central for. Or -- if you live there already -- staying in South Central for. 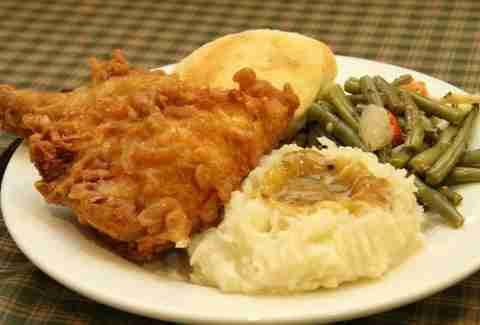 This '50s-style diner has been on your way to LAX (if you take the right route) since, uh, the '50s, and it's been famous for its fried chicken that whole time. Expect it to be classic (and served with waffles in the AM). 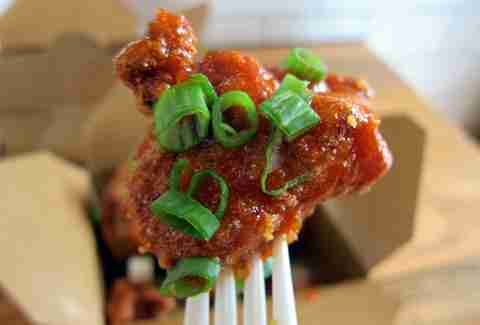 It may be best known for its Korean-flavored meatsticks, but Seoul Sausage Co.'s jalapeño/kimchi-topped "KFC" (aka Korean Fried Chicken) was one of the judges' favorites. 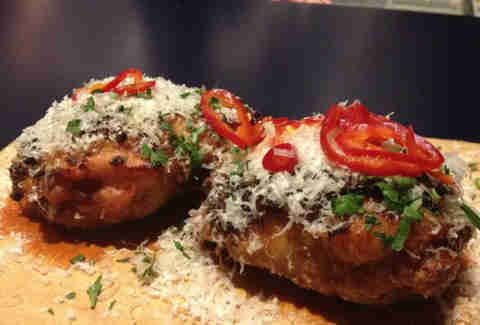 Spoiler alert: its younger brother made it farther up the list, but the OG Superba is still on it, with its vinegar-glazed, red pepper-topped bird. One of the best patios in LA? Check. 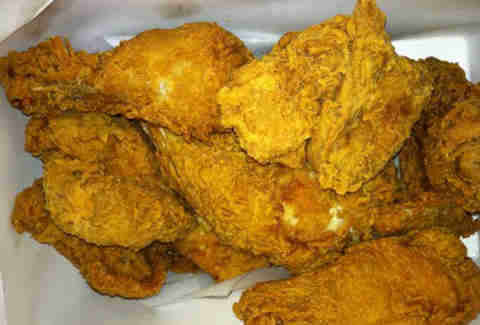 One of the best fried chickens in LA? Double-check. 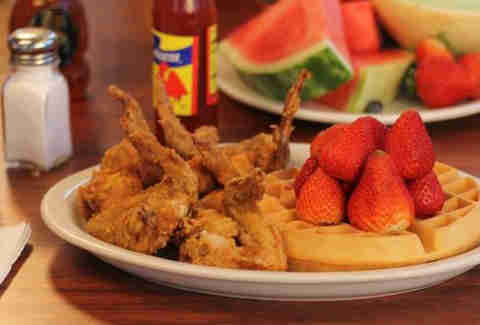 Served with waffles at breakfast? Oh yeah, that's a triple-check. 8. 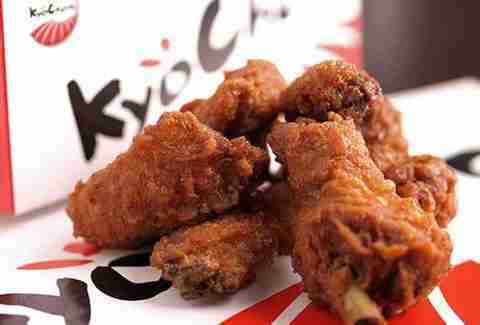 Tokyo Fried Chicken Co.
Like Pete Holmes, this strip mall-located, Monterey Park Asian eatery keeps it crispy. It does it with perfectly fried chicken, but the real killer here is the sauce selection, which includes homemade spicy ponzu and soy. Thankfully, it's also got a great craft-heavy, Asian beer list to wash it all down with. 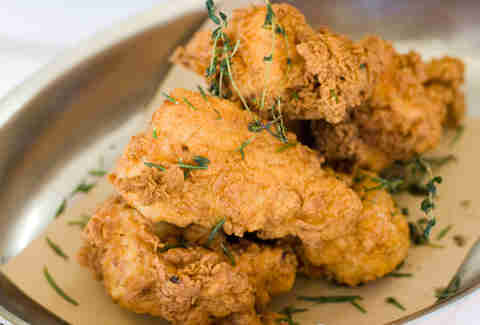 The Beverly Hills outpost of Thomas Keller's beloved bistro busts out this famous buttermilk-fried chicken (from his infamous Yountville restaurant Ad Hoc) on the first Monday of every month. 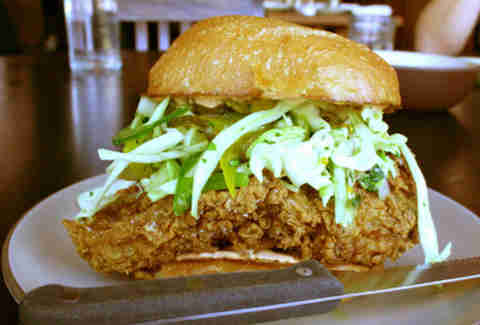 When the two dudes behind Animal opened their seafood-centric restaurant Son of a Gun, it's hard to imagine they'd think their fried chicken sandwich -- perfectly juicy & topped with slaw and sauce on a moist, buttery bun -- would become the signature item. It has. Deal with it. 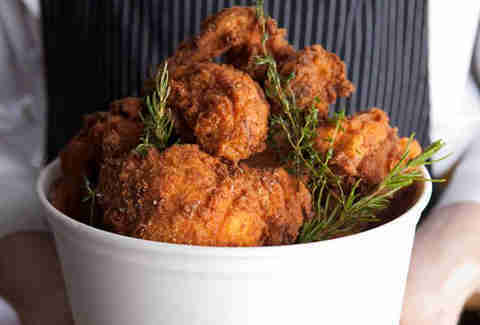 The higher-ranked of the two versions of Thomas Keller's famous Ad Hoc fried chicken on this list is -- ironically enough -- not the one at the Keller-owned restaurant. But that's not a huge surprise -- the chef at this Westside favorite (which serves that chicken as a family-style dinner on Sundays) did major time at Ad Hoc before moving to LA. 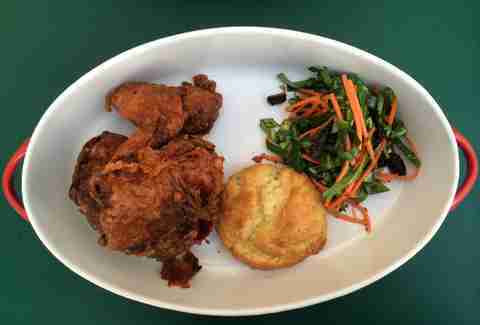 Venice's recently opened, ultra-casual, open-air lunch spot's made a rapid ascent up this list, with a Sunday-only dish that's served as a half-chicken with a collard greens slaw and a legendary biscuit that has something to do with General Robert E. Lee. It's a good thing this Korean fried chicken joint is open until 3am, because the soy-glazed amazingness tastes even better when your eyes are, uh, glazed too. 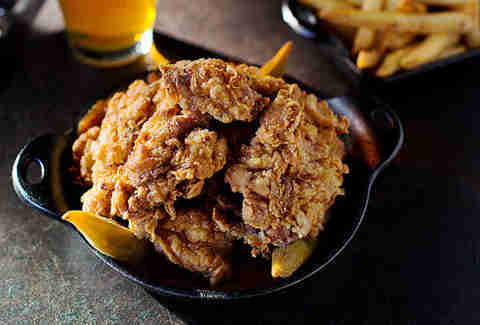 Big 'ol burgers and delicious cocktails make up much of the menu at this fast-growing gastropub chain, but the real treat is its maple-glazed, savory-and-sweet fried chicken. 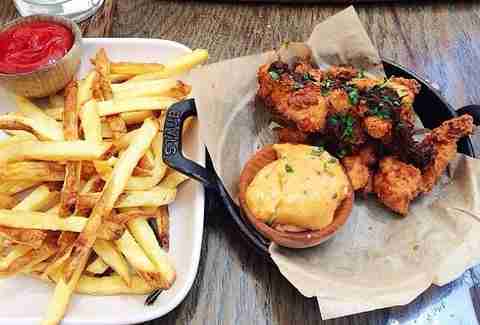 It wasn't even a close race: this Culver City soul food standby took the top spot handily. Jeff Miller is Thrillist LA's Senior City Editor and would like to thank all of the judges for their fried chicken knowledge, including Jason Kessler (FlyAndDine.com), Carole Dixon (TheCaratDiet.com), Joshua Lurie (FoodGPS.com), Lesley Balla (Zagat.com), Lesley Bargar-Suter (LAMag.com), Matt Kang (Eater.com), Garrett Snyder (LAMag.com), and Esther Tsent (EStarLA.com).